A state agency has proposed to establish a new launch pad at NASA’s Kennedy Space Center in Florida to support the launch of Boeing’s Phantom Express unmanned vehicle, Florida Today reported Sunday. 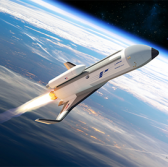 The Defense Advanced Research Project Agency’s teamed up with Boeing in May 2017 under the Experimental Spaceplane 1 program to help design, build and test a reusable spaceplane. Space Florida plans to set up Launch Complex 48 between the SpaceX-run pad 39A and Launch Complex 41 that accommodates missions of the United Launch Alliance-built Atlas V rocket. The agency intends for the launch pad to serve as a shared facility and has initiated talks with eight other rocket developers to facilitate the use of LC 48 in future missions. Space Florida also has suggested the development of three KSC-based landing pads in a move to provide Blue Origin, SpaceX and other launch services firms additional landing options for their reusable boosters. The report said the agency expects the landing pads, also called Landing Zone 2, to be operational by mid-2020.